scconds instead of 10.7 pound-seconds as would be required for the 5-pound piston. This value of 6.8 pound-seconds should be possible of attainment with relative ease, while a value as high as 10.7 pound-seconds might present difficulties. Also note that the piston velocity V\ and piston energy E'» remaining after impact arc reasonable values, as are the heat loss Eh and initial piston velocity Vi. Having analyzed the factors which are involved in imparting velocity to the bolt, it remains only to consider the motions of the gun mechanism during the completion of the automatic cycle of operation. After the piston has acted on the bolt, the bolt moves to the rear at high velocity, travelling of its own momentum. There is a slight blowback which still acts on the bolt after the piston impact, and this action produces a small increase in the velocity of the bolt motion. The bolt must continue its rearward motion until the opening between it and the barrel is great enough to permit feeding a fresh cartridge. The motion of the bolt mast then be reversed to load the fresh cartridge into the chamber and lock the breech. 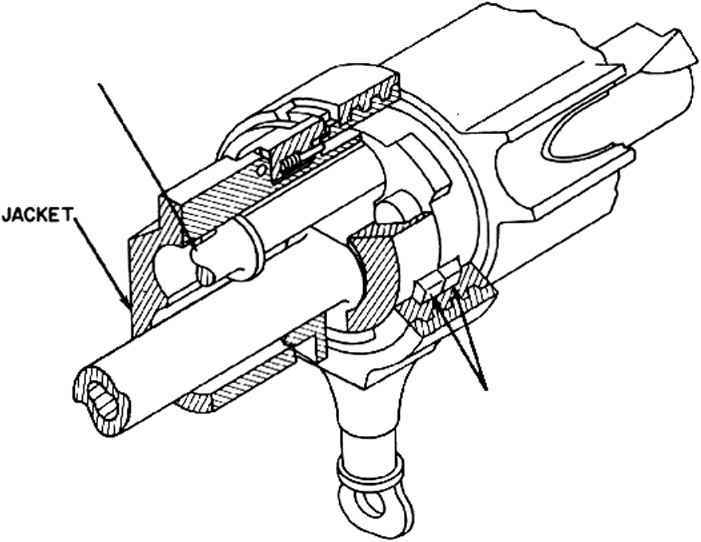 This action of the bolt in a gas-operated gun is similar in some ways to the corresponding action in guns employing other systems of operation and, although the action has been explained previously in this publication, the explanation will be repeated here to avoid the inconvenience of cross-referencing. In some guns, the reversal of the bolt motion is accomplished entirely through the use of a relatively powerful driving spring which is compressed as the bolt moves in recoil. The buffer and spring absorb the kinetic energy of the bolt over the full recoil travel, finally stopping the rearward motion of the bolt when all of the kinetic energy has been absorbed. The spring is designed so that this occurs when the opening is sufficient to permit feed ing. The compressed spring then drives the bolt forward to complete the operating cycle. This type of design has a serious drawback from the standpoint of speed of operation. Since the bolt is gradually slowed down by the spring, its velocity varies from maximum at the beginning of recoil to zero at the end of recoil. (See fig. 3-14, a graph showing how the bolt velocitv varies with time under these condi-tions.) The fact that the bolt velocity varies from maximum to zero in the manner illustrated means that its average velocity will only be slightly greater than one-half its maximum velocity. In other words, if this type of action were used in a gas-operated gun, in spite of all the pains taken to achieve a high initial bolt velocity, the overall travel of the bolt would be accomplished at a much lower average velocity. To overcome this disadvantage, the bolt driving spring can be made relatively very light so that it offers a low retardation and will permit the bolt to move its entire recoil distance with little loss in velocity. In this case, the function of the driving spring is merely to provide a positive force which is just sufficient to insure that the bolt will close. Stopping the bolt at the end of its travel and reversing its motion can be accomplished by causing the bolt to rebound from a so-called "backplate buffer". This device is in effect an extremely stiff spring which absorbs all of the kinetic energy of the bolt over a very short distance and then delivers energy back to the bolt to propel it forward. The reversing action produced by the backplate is so abrupt that the effect may be classified as an elastic impact.